The first time that I stepped into Much and Little, I was walking along Main Street with a friend and decided to go in and take a peak. 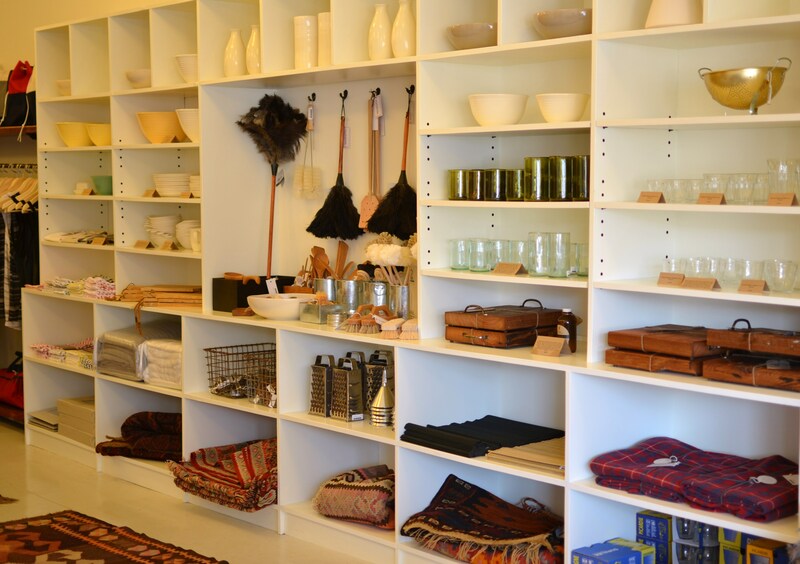 Much and Little carries housewares, clothing, and accessories with a focus on local and sustainable products that are well made and designed to last. The owner Sarah’s design and art background are apparent when you set foot in the door. The beautifully merchandised store has something for everyone including those hard to shop for people in your life. Sarah’s philosophy is that we should love the items that we use everyday and that they should be tactile, comfortable, simple, functional, and we should not get bored of them. Sarah selects items that have a heart and soul and are made by real people and use natural materials. Much and Little carries many unique eco-friendly and artisan housewares that are perfect for the foodie in your life. 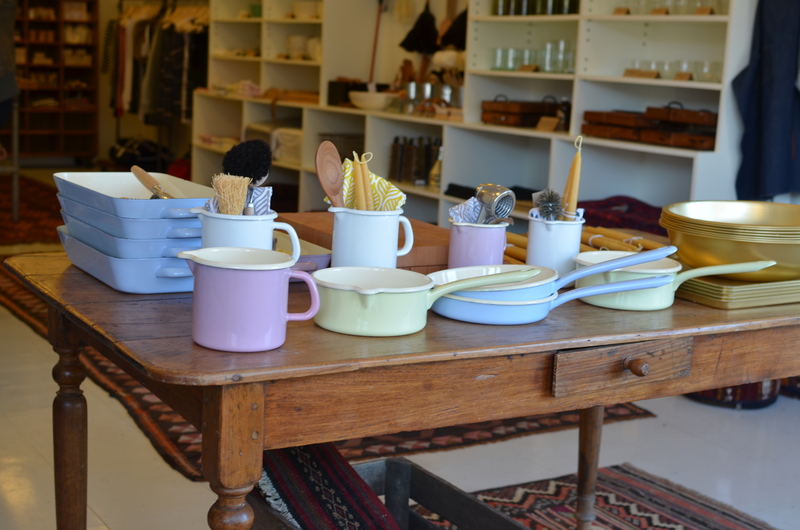 The Austrian made Riess enamelware is all natural and made from crushed glass, pot ash, metal oxide and steel. The enamalware is free of heavy metals and safe to use for those who have nickel allergies. The enamelware heats up quickly and distributes heat evenly without imparting a taste or smell. The pots and dishes can be used stove top, in the oven and are dishwasher safe. The twenty centimeter saucepan sells for $41.95, one liter stockpot $42.95 and the one liter measuring cup in white costs$43.95. Much and Little carries a large selection of wooden spoons made by Jonathan’s which are made from cherry wood. 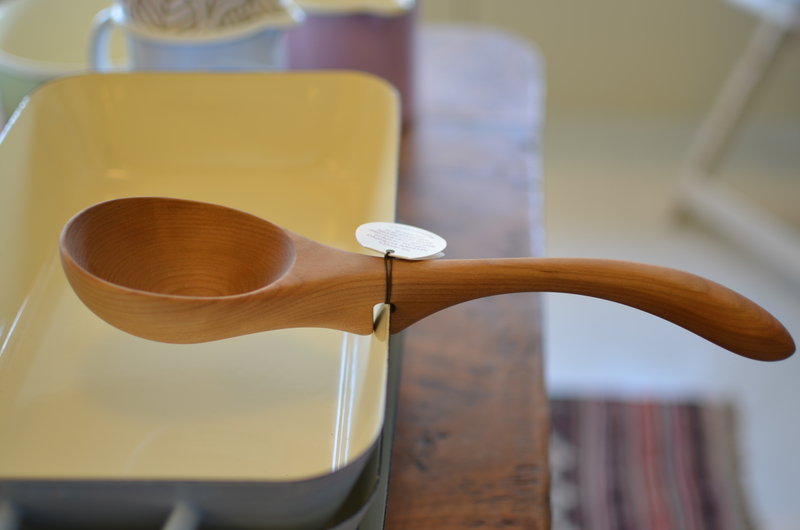 My favorite items by Jonathan’s include a wooden pie server ($20) and a lefty stirring spoon($24). Shown is a hand carved ladle that can rest on the side of a pot ($46). Japanese cast iron bottle openers $24.95 each. 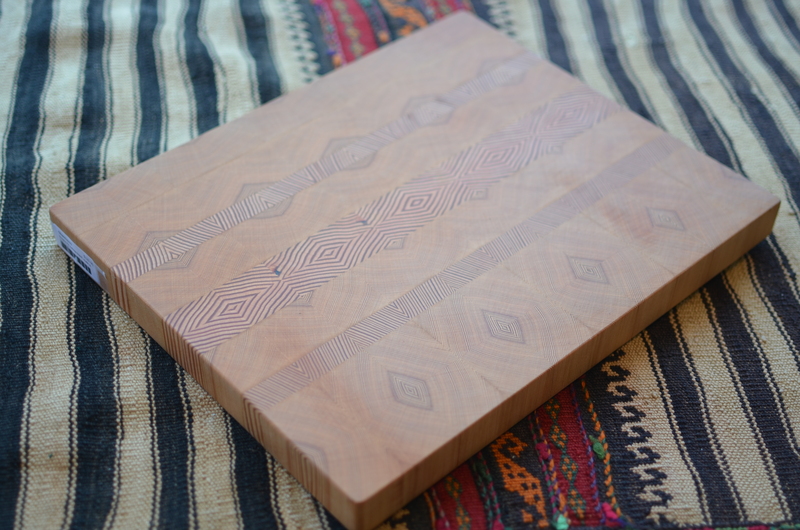 Local artist James Steidle, uses end pieces of Douglas-Fir to design this cutting board, small ($110) and large ($120). 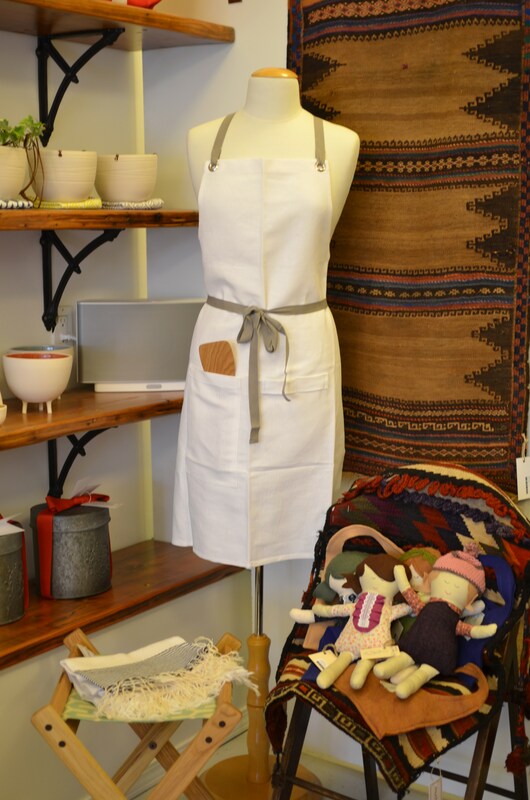 Studiopatro’s cotton and linen blend apron($78), criss crosses at the back to prevent pulling behind the neck. The pockets on the front hold cooking utensils and there is a place to tuck a tea towel. Enjoy your next candle lit dinner with a soy candle ($29.95) made by Sydney Hale Co. Their candles come in many unusual blends like Tobacco+Sandalwood, Coco+Espresso and Much and Little’s most popular seller Fir+ Blue sage. 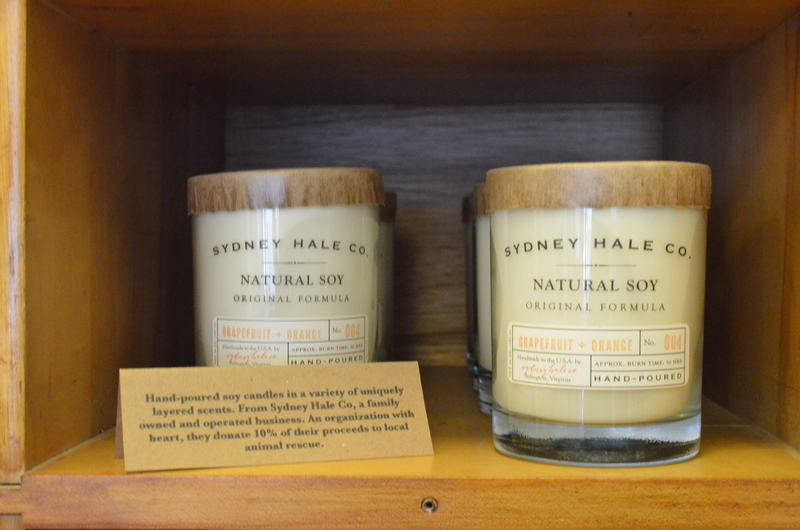 Sydney Hale Co donate ten percent of their profits to animal rescue. Much and Little is located on 2541 Main Street in Vancouver, BC and open Tues – Thurs & Sat 11-6 pm, Friday 11-7 pm and Sun 12-5 pm. Contact Much and Little at (604) 709-9034 and email at helloatmuchandlittle.com. You are currently reading Unique and Eco-Friendly Gifts for the Foodie in Your Life at Coriander Kitchen.